This product is no longer available, please see our list of biocides or contact us to discuss your application. Accepta 2526 is a high performance non-oxidising biocide based on bronopol scientifically formulated for use in a range of industrial and process water treatment applications. Accepta 2526 is a highly effective low foaming, broad spectrum disinfectant and biocide that is effective against Legionella bacteria and other unwanted organisms. Accepta 2526 can also be used as a secondary biocide in systems being treated with halogen. 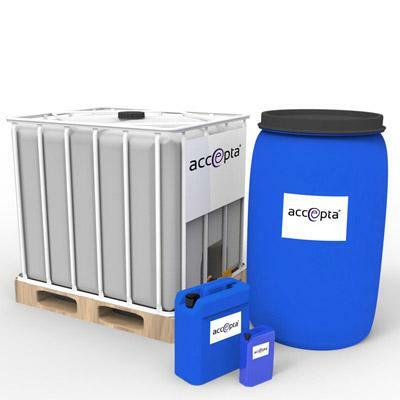 Accepta 2526 is supported through the Biocide Products Directive. Dose Accepta 2526 to give 200 ppm (200 g per 1000 lt). Accepta 2526 can be dosed by hand or through automatic dosing equipment. Alternate the use of a biocide with a second product to prevent the development of resistant bacteria strains. Accepta 2526 is compatible with most cooling water treatment products. But do NOT mix neat products. For further technical assistance concerning Accepta 2526 please contact Accepta.